I don’t know what to say. When I was first scribbling my thoughts on Sergei Loznitsa’s In the Fog last night, right after first seeing it, I initially considered a three star rating. Then I bumped it down to two and a half stars and began putting together the first paragraph. (This was not the original first paragraph. The original opener has been hacked apart and its remnants have been inserted variously into the remainder of this review). Then, when I sat down again 24 hours later to write the rest, the more I wrote, the more conflicted I felt. Did I want to recommend this movie or is it not worth your time? Details from within suddenly sprung up, clouding my thoughts and requiring some serious contemplation (which I am not particularly a fan of at ten o’clock at night). What follows may not be ideal, but it is closest to how I currently feel. Read on. I hope this makes sense. If nothing else, In the Fog is a masterpiece of atmosphere. Set nearly exclusively outside in a Soviet winter, circa 1942, the numerous exterior shots show plenty of snow-covered ground, leaves strewn about, the cold and empty trees above, and of course, fog (but most of that is saved for the end). The first scene of the film takes place in a small Belarusian village, where a handful of men are executed. Next, Sushenya (Vladimir Svirskiy), who lives in a small shack with his wife and child, is visited by Burov (Vladislav Abashin) and Voitik (Sergei Kolsov), two Belarusian partisans. He’s suspected of Nazi collaboration – it’s believed he was involved with the execution in some way (I won’t say how). It’s clear that the plan is to take Sushenya deep into the woods and kill him, but this is never said out loud. At some point during the trek, the group falls into a trap set by the Germans – a hail of gunfire rings out, and Burov is wounded. Following this, a series of flashbacks slowly fill in the story, adding explanation to events mentioned in passing in the sparse dialogue that was uttered towards the start of the film, and adding background to our characters. There’s an odd visual hypnosis to In the Fog, which ensures that the very slow film isn’t a total bore. DP Oleg Mutu frames the characters’ surroundings in a very clear way (except for the final shot, which gives In the Fog its name). There are numerous long takes, and there’s no artificial soundtrack. You feel time pass, in whatever setting the current scene might be taking place in. Loznitsa has made one of the most deliberately paced and definitively set movies I’ve seen in a long time – there’s no trickery, just the characters present and the setting to tell you what you need to know. So what’s the problem, you ask. Well, it’s what happens when the movie is over: nothing. I feel like I’ve been repeating myself lately – there’s nothing objectively wrong with this movie in a technical or creative sense. If anything, this is one of the most stunning movies I’ve seen all year from a purely aesthetic sense. And the direction is more than capable. As for the performances, they are mostly silent, but certainly efficient. But it’s painfully obvious that Loznitsa wants his film to linger with us long after the end credits have rolled. To mull over the events at hand, to analyze what was seen and how it was done. But this never happens. There’s something, perhaps the alienating pace, that ensures a certain amount of distance from the movie to the viewer. Where a film like Amour, with the exact same running time (127 minutes), is able to be powerful and harrowing with the way it’s presented with a similarly slow pace, the same can’t be said about In the Fog, which has a huge backdrop to work with and introduces some interesting ideas, but doesn’t seem particularly interested in evolving them to a full representation. So what is left to be said? In the Fog pushes at a steady but sometimes nearly excruciating rate, chock-full of gloom and doom, set against the brooding background of war and crime. There’s a certainty in its intent that travels throughout, but does it really mean anything? I’ll take a thoughtful, more risky movie like this over the worst of Michael Bay explosion parades most days, but there is a similar disconnect at hand – the visuals are striking but its intended impact is far lesser than the actual one. So this might seem like a “thumbs down” review. 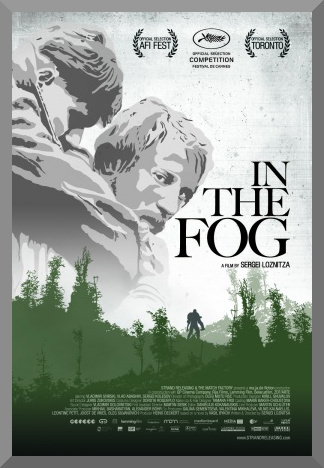 But if you are even remotely interested, I urge you to see it, if for no other reason, then to perhaps draw another conclusion on In the Fog, a film with little to show but a lot to see.